We sat at the kitchen table discussing what no parent wants to discuss—the death of a child. They were elderly. They had lived long and storied lives. Still, this was no easy conversation. Faces were long. Tears flowed. Their beloved child had not always lived the life they had taught her to live. Reflecting brought pain to parents who had already known more than their share of heartache. Everything was not somber, though. Throughout their lives there were good times mixed in with the bad. There were joys sprinkled in the midst of sorrows. There was also the consolation that, late in her life, this prodigal child had come home. Her heart had been humbled, but her health was wrecked. Even as the tears were still flowing, peace enveloped the room as we began to recall some of the ways her life had been used by God in recent years. I leaned forward to take in more of this moment. I noticed something about the elegant casserole dish placed as a centerpiece for the table. It had never before caught my eye. The lid on this elaborately decorated dish was cracked in several places. The cracks were hardly visible, until you looked at the lid very carefully. As we continued to talk, I asked about the dish. I was told that it was a gift from a family member, one of their prized possessions. My hostess was quick to point out that they didn’t use it any more, since the lid was broken. The only indication of what had happened was when she raised her eyebrows and gave her husband a not-so-subtle glance. She told me of the many years this dish was used to serve a warm meal for the family to enjoy. Even though they didn’t use it for this purpose any longer, it was still important to them, since it held so many precious memories. 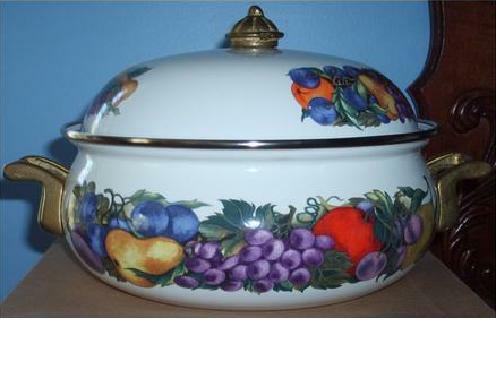 The value of this ceramic bowl and lid was sentimental. It could not be measured in terms of intrinsic worth. It was precious to them because of the value of the memories it held. It occurred to me that it symbolized more than the past, though. It seemed, also, to be well suited as a metaphor of the present. With its brokenness mended, there was still an important place for this dish in their lives. There was a sense in which it was cherished even more. That is how it was for them and their dearly-loved, recently-departed daughter. With the spiritual maladies in her life mended by the Great Physician, she had become even more precious to them than ever before. Her life had been broken, perhaps shattered would be a better word, but God had put her back together. The cracks were still visible, too. There were many things that she could no longer do. Her brokenness prevented this. But, her victorious emergence from the gristmill of life in “a distant country” was a testimony of the grace of God and the power of prayer. In spite of the many wayward paths she had taken, there was still much to celebrate in the end! That is how it is for each one of us. We are all cracked pots. Our brokenness is “mendable” only by the powerful working of God’s matchless grace. Though we sometimes try to hide the cracks, they are still visible. We’d all be better off, in my estimation, if we didn’t try to conceal them at all. In fact, it would probably bless a lot of people if we would be willing to put all our broken dishes on the table, exposing our brokenness to the world. This way all who get close to us can marvel at God’s handiwork in putting us back together. It just might be that when others see how highly valued we are to our loving Father who mends our brokenness, they might get the sense that God cherishes them, as well. O, Lord, make me stronger through broken things. If we will unashamedly acknowledge and exhibit God’s handiwork in our lives, we will also be constantly reminded that God has a purpose and place for us in His service. We are created in Christ Jesus for good works, right? Remember: God has mended our vessels so that He can fill us full-to-overflowing with fabulous treasure that He wants us to share with the whole world. God uses broken things.